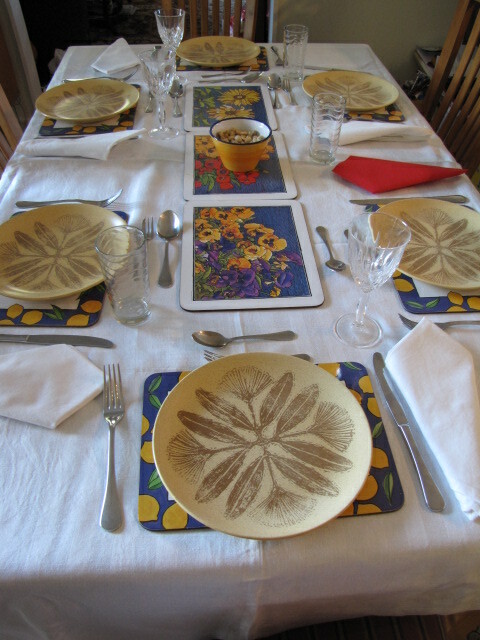 I like this pattern.... a matt yellow with pohutukawa printed on it. 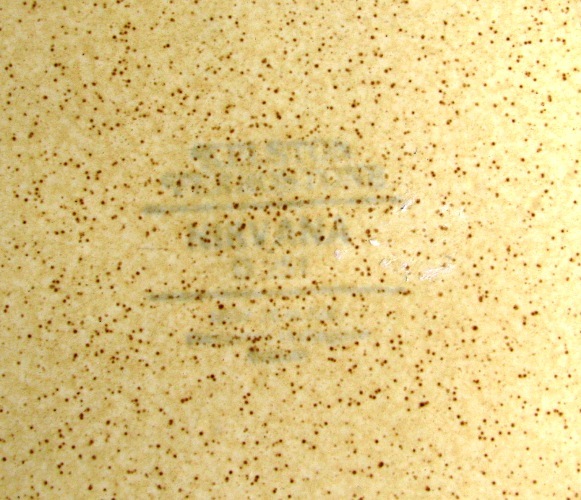 I saw the mould that imprinted this pattern at the Portage Ceramic Trust Roadshow at New Lynn. and the hard to read backstamp.. Interesting to see how the elements of the original design had been used to produce the Nirvana, slightly simplified and reduced to a single colour on a mottled ground. The printing mould as you describe it appeared to me to be a rubber stereo mounted on a base to suit the printing process, possibly the Murray- Curvex machine. This technique of making rubber stereos was exactly the same as used to make the rubber backstamps and is used extensively in the printing industry to print all sorts of wrappers in reel form , known as Flexographic printing. That Nirvana printing mould certainly fascinated me! Yes I believe it was used on the Murray Curvex machine and I would have loved to have seen that machine in action! This mould you mean ?? Many of the patterns in the Patterns book at the Museum mention the Murray Curvex Machine .... so they must have had many moulds with the pattern on it like that one. I wonder if they could only use this system on the 'shallow' curved shapes ....? I collect Nirvana and absolutely LOVE it. I was just wondering if anyone knew if any other pieces were made apart from the standard dinner set pieces. I also love the Nirvana pattern as it is sooooo typically New Zealand! only the plates and side plates. Others may have though. Fantastic forum. I have many, many plates (in dinner, lunch and bread and butter) and luckily they all seem to be the same. 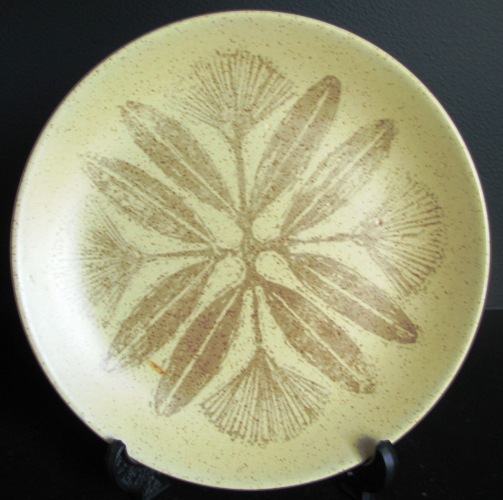 I bought another plate today online and it was quite different - the speckled bit was a lot darker and it had a lot of divots in the pattern (kind of like what can be seen in the pic at the start of this thread). Luckily mine have none of these flaws! LOVE the pattern so much. a new batch of glaze can also be a reason for variations in colour. as they mention that the Nirvana pattern wasn't put onto bowls, or cups and saucers. A plain warm speckly 'mustard' glaze matches well it seems. Very interesting to see the Nirvana info in the Crown Lynn Patterns Book, as it looks like there are two colours that it was made in - Ivory and Buff. So this explains why some is a darker shade than others. 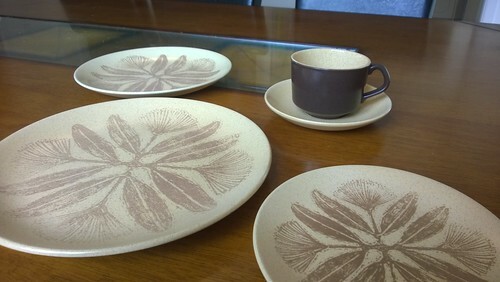 It appears that only the side plates and the dinner plates had the pohutukawa pattern on them. This was on the shallow Coupe shape. Ivory had Matt Brown outside and Ivory Flushing Glaze Inside on the cups I gather which would be 3038's as the saucer is 4029. Buff had Rusticanna on the outside as well as the inside of the cups. The 4029 saucer and the 3038 cup with the squashed handle belong together. So far I've ended up with dinner, lunch, side plates and saucers in both shades, but the cups have been eluding me - does anybody have a picture of the other style of cup that went with this pattern? Same crockery - it's amazing what slightly different lighting does to the colour of these plates. We do like this pattern - in fact it is still in regular use at our place! Interestingly, the Ivory saucer is stamped as being colourglaze rather than Kelston Ceramic like the Buff saucers are. I don't think I've come across the other Nirvana cup and saucer yet. I do have the cups with the matt brown outside and warm speckled inside like the one in your photo Bruno and the matching warm speckled saucers. I would love to find more Nirvana as I have a set with dinner plates, luncheon plates, side plates and just 3 dessert bowls. The dessert bowls have the background colour but not the pattern. I don't think I have ever seen cups and saucers. I used the set at Christmas last year. That looks great Thelma and very appropriate as the Pohutukawa is our Xmas flower. Not sure if this will get to you but have spotted a page with Crown Lynn design Nirvana mentioned. David Jenkin didn't design the Nirvana range although he may have adopted it in the colourway that it was eventually marketed as. I submitted the design in their Annual Design Awards in the mid 1960's. It never obtained a prize that particular year but have in other years. I did hear from Crown Lynn later, from the then Crown Lynn marketing manager who from memory was David Topham (Alan Topham). He told me that they were going to market the design and would send and did a full 6 place set. It isn't important but thought you may like the designers name. I was an advertising creative based in Wellington for some 45 years and am a friend of Colin Simon who was very successful in the Annual Crown Lynn Awards back then. I am home from my travels, so now I can reply properly, I hate trying to write on my fiddly phone screen. If this is OK with you, I would like to put your message on the NZ Pottery website and also forward it to the Crown Lynn museum, so it is permanently in the records. You were right about the marketing manager, his name was Alan Topham. Are you able to tell me what colours your design was? Also it would be interesting if you can add a bit more about how you came up with the design - and any more info that might be relevant. I love the Nirvana design and I have a full dinner set stashed away. Thanks again for taking the trouble to email me. There are so many unknowns in the Crown Lynn story, mainly because so much of their paperwork was destroyed in fires or when the factory was demolished. I honestly can't say how I came up with that design. Was obviously based on the Pohutukawa. From memory and we are talking maybe 1970 I do recall what I entered was earthy colour ways. The base would have been dark brown and maybe the blossom and leaves also various lighter tones of brown. I do know that the blossom was not red as in real life maybe deep warm brown. 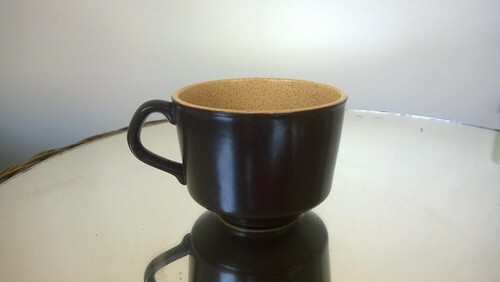 The motif was not on the cup which was dark brown. I didn't like the colour way that it was produced in, but then I wasn't as close to the market as Crown Lynn were as regards colour. Crown Lynn were a curious company as the design awards were held bi-annually from memory but they did once have an award 12 months apart. From memory that was for a coffee set cup and a jug and lid for jug. I received a consulation prize that year and the awards were presented in Wellington. I was invited and attended that being in the capital rather than Ak. The whole purpose that year it seemed was that the then CEO of Crown Lynn Tom Clarke used the evening as a platform to launch a salvo at (Prime Minister) Keith Holyoake (as his wife presented the awards) or rather the National Government to make a some political point. It would have been regarding export markets probably, as apart from prize winners the audience were mainly NZ ceramic ware retail buyers. I also recall that was they launched that night a new style with a cup that had a ball shape about the size of a golf ball affixed to the cup rather than the standard cup handle. Designers that were there were curious as to whether the ball would be rather hot to hold although David Jenkin etc. would have tested that no doubt. As I also said I was in an advertising creative for 45 years and found that game fascinating as to what consumers are drawn to. By that I mean what makes them tick - particularly women. I don't say that at all in a male chauvenistic way either. We the agency and Cadbury concluded that it must have been that females, the majority of purchasers, saw Orchids as having some type of superior or snob image as regards gift giving. (there were more comments about advertising which are not relevant to the Nirvana design). This photo was taken at the Crown Lynn Crockery of Distinction Exhibition that was on in Wellington and Auckland and shows Design Award entries. It includes Nirvana with red flowers and green leaves which was the original entry. It's great to have a designer name for this. Crown Lynn also made this pattern in green, gold and brown on a white background and named these Botany Green, Botany Gold and Botany Brown.